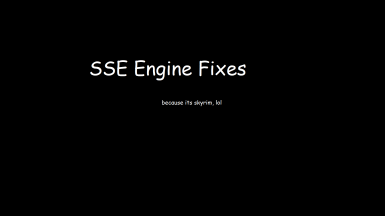 skse64 plugin to fix various issues with the Skyrim Special Edition engine. Gypsy Eyes Caravan - Legacy of the Dragonborn Patch (with optional retexture) Highly Recommended to reduce or eliminate freezing and CTD. Standalone EFF Cosmetic Menu Soft requirement. This fixes the mouse bug but technically the menu works fine with keyboard only. Add a fix for spell absorb triggering on conjuration summons from enchanted items. (see: https://afktrack.afkmods.com/index.php?a=issues&i=26414) Thanks to Ryan for the fix as ever. Add fix for broken object LOD. If this causes graphical glitches elsewhere, you can just disable it for now, it won't cause anything but visual glitches if there are bugs. Rewrite sound category saving to fix a bunch of crashes. Hopefully fix addon node warning showing extra times when disabling/enabling plugins in-game. Fix crash on startup caused by bethesda.net connection issues when living in specific regions. Thx to the people who provided crash dumps + Nukem & SniffleMan for the usual. Fixed a typo in my tree LOD code preventing disabled tree LOD from hiding. Add the achievements with mods active patch so I can use less DLLs :P If you were previously not using this please disable it to continue seeing your save games. Force disable form cache fix if SSE fixes is detected, since people aren't removing SSE fixes properly and breaking their games. A WIP skse64 plugin for Skyrim Special Edition to fix bugs and patch issues. ﻿If you had Engine Fixes installed prior to version 3.0 you need to re-download the Part 2 zip and re-install it, there is an update. Install the Part 1 zip as you would any SKSE plugin, be that through your mod manager or directly to your data folder. ﻿The "_preload.txt" file is required to be in the directory if you want to use the memory manager patch, so if your Mod Manager warns you about it, make sure it gets added. For configuration see the INI Settings below. The defaults should be stable for all users. VerboseLogging (default: false) - Enables more verbose logging in the log file. CleanSKSECosaves (default: true) - Deletes SKSE cosaves with no matching save on launch. DisableChargenPrecache (default: false) - "Precache Killer" function, duplicated from RaceMenu. EnableAchievementsWIthMods (default: true) - Enables achievements when you have mods installed. FormCaching (default: true) - Caches recently accessed forms. Similar to SSE Fixes. MaxStdio (default: true) - Raises max file handle limit from 512 to 2048, which should fix "False Save Corruption" bug in most cases. RegularQuicksaves (default: false) - Makes quick saves use the regular save handler. SaveAddedSoundCategories (default: true) - Saves volume settings for mod-added sound categories to a separate ini file. This functionality is the same as Audio Overhaul for Skyrim SE's dll, but they will not conflict. TreeLODReferenceCaching (default: true) - Requires FormCaching. Fixes the very slow Tree LOD function that causes framerate drops most noticeable in Riften. Similar to SSE Fixes. WaterflowAnimation (default: true) - Decouples water flow animation from in-game timescale, so that decreasing/increasing your timescale doesnt mess with the water animation speed. WaterflowSpeed (default: 20.0) - Sets the waterflow speed for the animation patch. The default of 20 is equal to the default timescale, and is probably OK unless you want the water to appear slower/faster for some reason. BethesdaNetCrash (default: true) - Fixes a crash on startup caused by improper handling of non-ASCII characters in Bethesda.net HTTP response headers. BSLightingShaderForceAlphaTest (default: true) - Forces alpha testing in the lighting shader. Fixes object LOD reflections on water. EquipShoutEventSpam (default: true) - Fixes a bug where the 'Equip Shout' script would fire a shout equipped event even if the equip failed. MemoryAccessErrors (default: true) - Fixes a handful of out-of-bounds or use-after-free bugs. Required for experimental memory patches. MO5STypo (default: true) - Fixes a typo in the ARMA (Armor Addon) form loader preventing 1st person female alternate texture sets from being loaded. PerkFragmentIsRunning (default: true) - See Misc Fixes SSE's readme﻿ for details. RemovedSpellBook (default: true) - See Misc Fixes SSE's readme﻿ for details. SaveScreenshots (default: true) - Fixes save game screenshots being blank when TAA is disabled. SlowTimeCameraMovement (default: true) - Fixes camera movement being slow during slow time effects. TreeReflections (default: true) - Fixes tree LOD reflections. Has no ENB conflict. VerticalLookSensitivity (default: true) - Makes vertical look sensitivity not tied to framerate. For detailed information on this engine limitation, see my reddit post﻿. This will pop up a warning box if your reference handle limit is above the configured warning levels at your main menu and whenever you load a save game. Over the course of a 100+ hour game session, it is easily possible to build a large reference count in your save game, so the Main Menu limit is by default configured to 800k, which is 250k~ below the actual limit. If you don't intend to play long saves you can probably safely raise this warning limit. The load game limit is set to 1 million (48k below the limit). If your save game is getting dangerously close to the limit it is possible to reduce the references stored in it using ReSaver﻿, but keep in mind this can cause things in your game world to disappear/respawn depending on your choices. Currently, the only solution to this issue is to either remove non-master plugins with large reference counts from your load order, or turn them into master plugins. MemoryManager (default: false) - Disables built-in memory manager for the game's largest heaps. This is the famous "Use OS Allocators" patch from LE. UseTBBMalloc (default: true) - If you enable the memory manager patch, this will also replace standard malloc with tbbmalloc. This does nothing if the memory manager patch is disabled. Source is available on Github﻿. While I intend to look into some other known bugs, no promises. If you feel like tracking down a bug and theorizing a fix or even implementing one yourself, feel free to contribute; I'm willing to maintain it for future game updates. Preloader can be found here﻿. tbb.dll and tbbmalloc.dll are Intel's Threaded Building Blocks﻿ library.